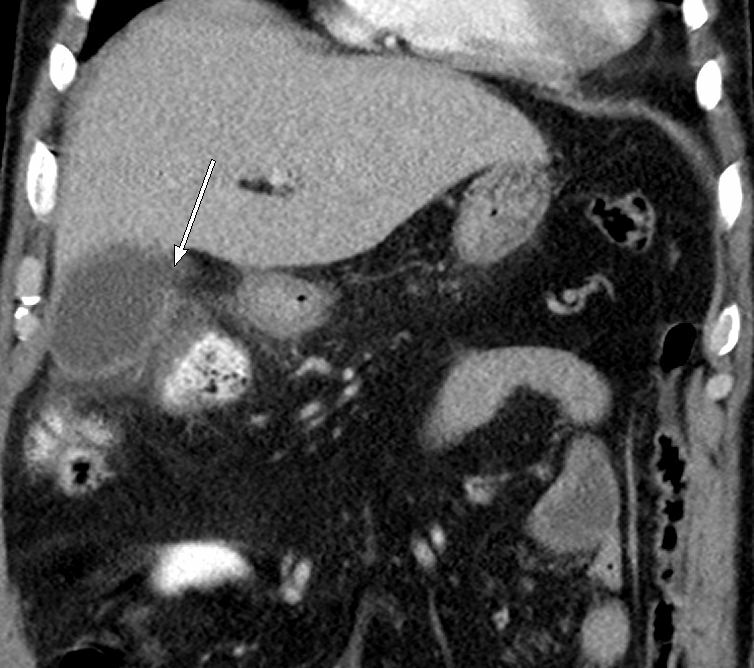 A 68-year-old male presented to the emergency department with worsening abdominal pain, which started four days prior. The pain was diffuse but more pronounced on the right side. Patient also complained of periodic non-bloody, non-bilious emesis for the past two days as well as subjective fever. On physical examination, he was afebrile with normal vital signs, had a soft, non-distended abdomen with tenderness to palpation in the right upper quadrant. There was no rebound or guarding. His labs revealed leukocytosis with a WBC of 16.3 and elevated total and direct bilirubin, 3.2 and 0.7 respectively. Alkaline phosphatase was within normal limits. Initial radiologic evaluation included a CT scan of the abdomen/pelvis and abdominal ultrasound. On the following day, the patient was sent to Interventional Radiology for percutaneous cholecystostomy. Since his symptoms did not improve, the patient ultimately underwent open cholecystectomy where the gallbladder was noted to be distended with patches of necrosis and free purulent fluid. Gross pathology of the specimen demonstrated an enlarged gallbladder with diffusely hemorrhagic mucosa and areas of full thickness necrosis consistent with acute perforated gangrenous cholecystitis. 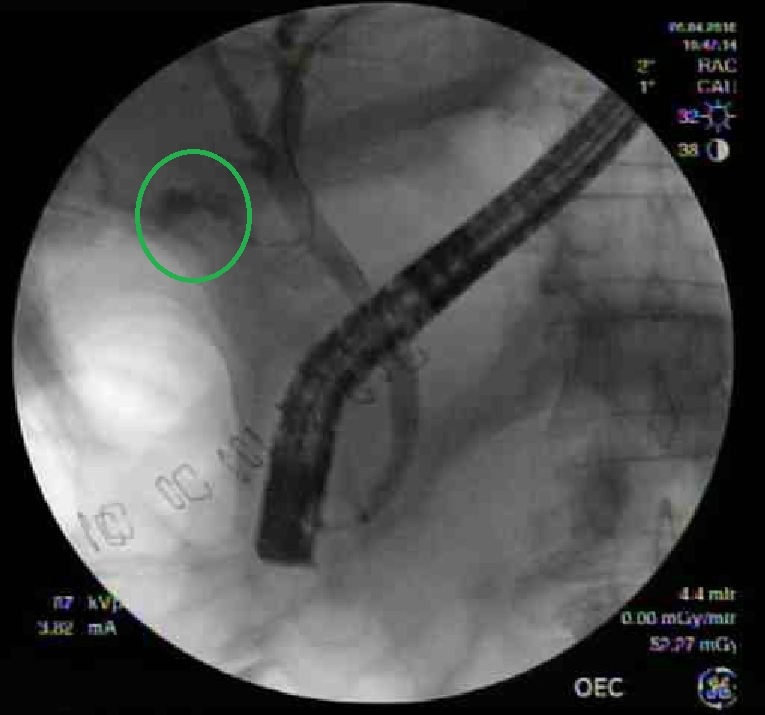 Due to subsequent findings of post-operative bile leak, patient received an ERCP with CBD stent placement. Outpatient follow-up two months later showed no residual bile leak and clinically the patient’s symptoms have resolved. Contrast-enhanced computed axial tomography was performed of the abdomen and pelvis with coronal and sagittal reformats. Axial and coronal representative images (Figure 1A and 1B, respectively) demonstrate a distended gallbladder with wall enhancement. Surrounding the gallbladder and extending into the hepatic flexure and right para-colic gutter is extensive inflammatory changes within the mesenteric fat. There is a defect/discontinuity within the gallbladder wall with leakage of bile. 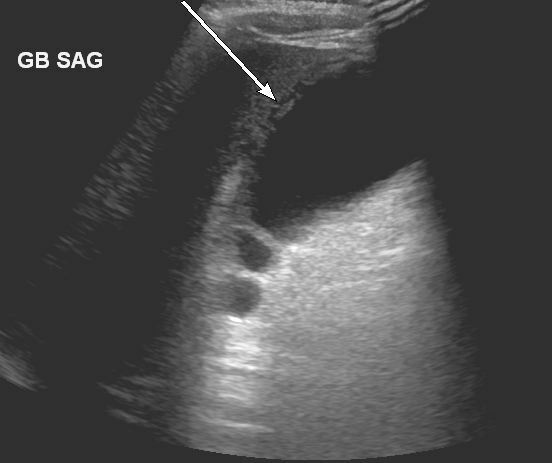 Ultrasound performed of the right upper quadrant of the abdomen (Figure 2) shows layering of the gallbladder wall. Additional sonographic findings included gallbladder sludge, wall thickening and pericholecystic fluid. No echogenic gallstones were seen. Magnetic resonance imaging was performed of the abdomen without the administration of gadolinium contrast on the day after admission. Imaging findings were consistent across different sequences and planes. 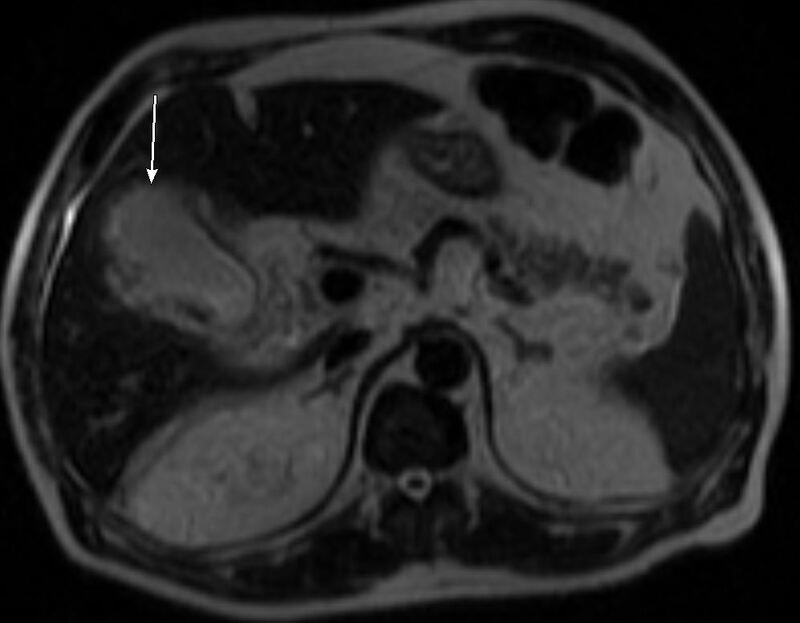 Representative axial single-shot fast spin-echo (SSFSE) T2-weighted image (Figure 3) demonstrates gallbladder wall disruption with bile leakage, consistent with the prior CT findings. Gallbladder wall thickening and edema, sludge and pericholecystic fluid and inflammatory changes were again seen. There was no MRI evidence of cholelithiasis or choledocholithiasis. 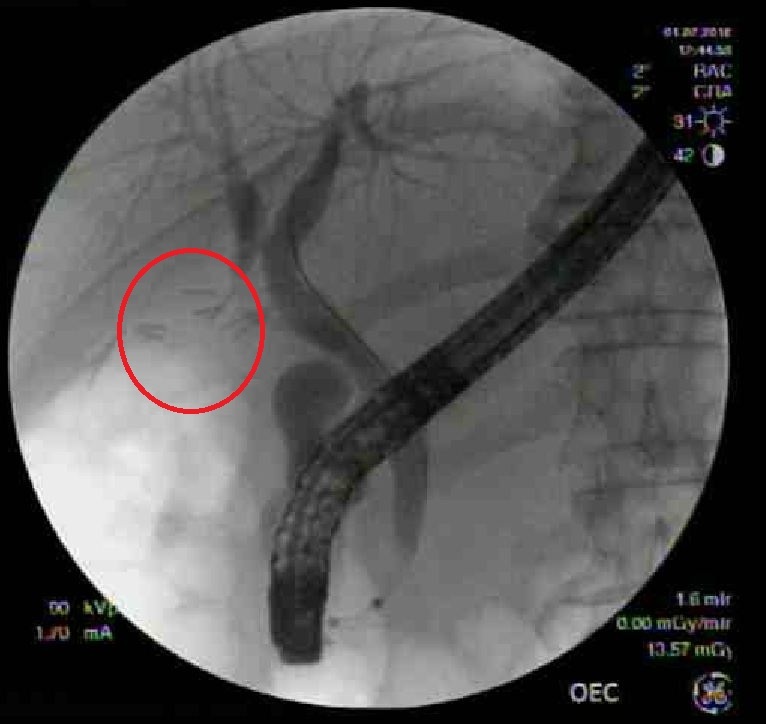 Subsequently the patient underwent an image-guided percutaneous cholangiogram and cholecystostomy drain placement by interventional radiology. During the cholangiogram, contrast is seen accumulating outside of the gallbladder and after placement of the drain (Figure 4), a contained collection is seen just lateral to the gallbladder lumen. 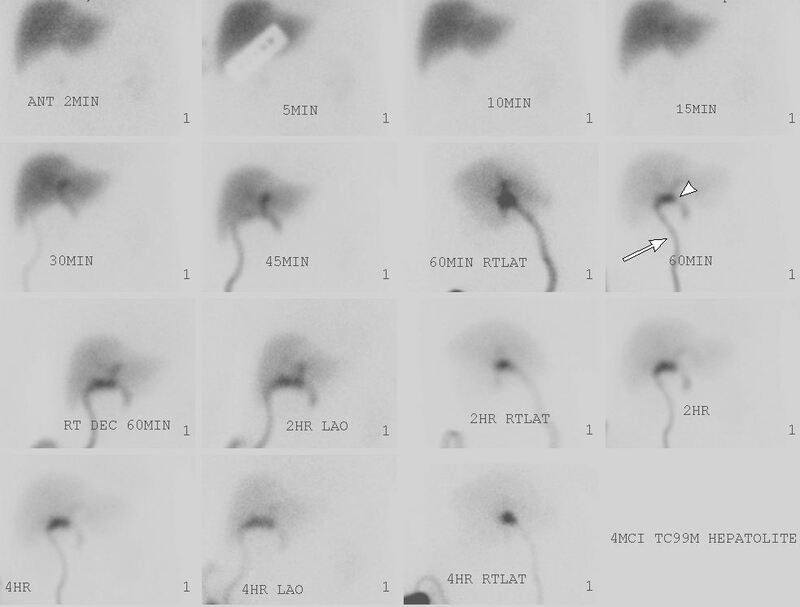 After the patient underwent an open cholecystectomy, the following day he had a nuclear medicine HIDA scan (Figure 5) which demonstrated a contained bile leak within the gallbladder fossa which was being drained by a Jackson-Pratt drainage tube. 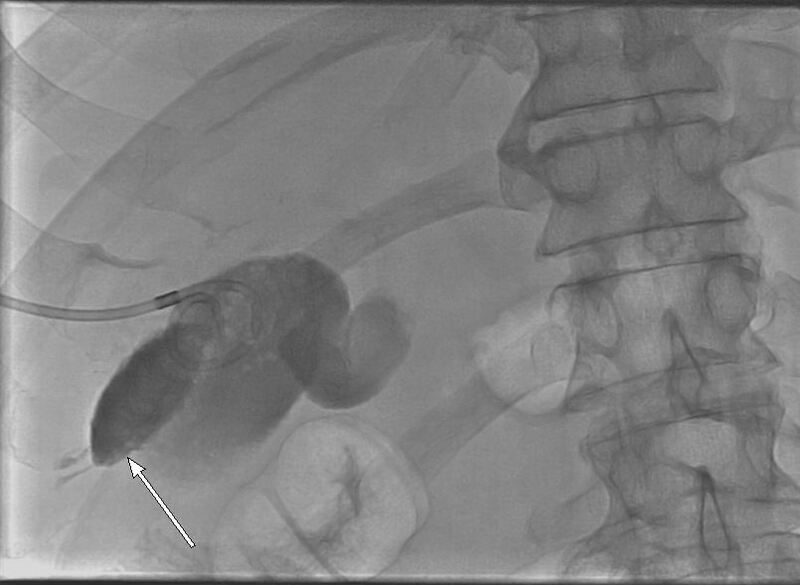 Due to the above HIDA scan findings, an Endoscopic Retrograde Cholangiopancreatography (ERCP) was done (Figure 6A) which demonstrated the presence of a bile leak in the region of the cystic duct. A common bile duct stent was placed covering the cystic duct remnant. Two months later, at a follow-up ERCP (Figure 6B), the stent was removed and no residual bile leak was identified. While acute cholecystitis is not an uncommon entity for which the diagnosis is usually made promptly, gallbladder perforation resulting from prolonged obstruction of the cystic duct is rarely seen. It is, however, more commonly seen (although still relatively rare) in cases of acute acalculous cholecystitis. It is critical to recognize the radiographic signs, such as a discontinuous gallbladder wall, which would suggest a perforated gallbladder so that patient care can be expedited. This is especially important as the morbidity and mortality associated with perforated gangrenous cholecystitis is much higher than its non-perforated precursor. Ryu JK, Ryu KH, Kim KH. Clinical features of acute acalculous cholecystitis. Journal of Clinical Gastroenterology. 2003;36:166-169. Mirvis SE, Vainright JR, Nelson AW, Johnston GS, Shorr R, Rodriguez A, Whitley NO. The diagnosis of acute acalculous cholecystitis: a comparison of sonography, scintigraphy, and CT. American Journal of Roentgenology. 1986;147:1171-1175. Morris BS, Balpande PR, Morani AC, Chaudhary RK, Maheshwari M, Raut AA. 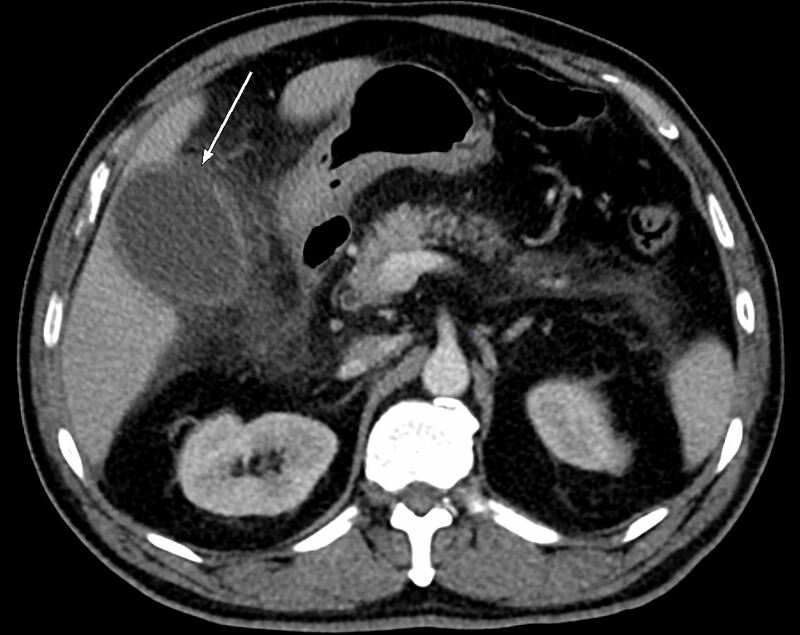 The CT appearances of gallbladder perforation. British Journal of Radiology. 2007;80:898-901. Diffenbaugh WG, Sarver FE, Strohl EL. Gangrenous perforation of the gallbladder: analysis of nineteen cases. Archives of Surgery. 1949;59:742-749. Derici H, Kara C, Bozdag AD, Nazli O, Tansug T, Akca E. Diagnosis and treatment of gallbladder perforation. World Journal of Gastroenterology. 2006;12:7832-7836. Kalliafas S, Ziegler DW, Flancbaum L, Choban PS. Acute acalculous cholecystitis: Incidence, risk factors, diagnosis and outcome. The American Surgeon. 1998;64.5:471-475. Niemeier OW. Acute free perforation of the gallbladder. Annals of Surgery. 1934;99:922-924. O’Connor OJ, Maher MM. Imaging of cholecystitis. American Journal of Roentgenology. 2011;196:W367-W374. Fidler J, Paulson EK, Layfield L. CT evaluation of acute cholecystitis: Findings and usefulness in diagnosis. American Journal of Roentgenology. 1996;166:1085-1088. Kim PN, Lee KS, Kim IY, Bae WK, Lee BH. Gallbladder perforation: Comparison of US findings with CT. Abdominal Imaging. 1994;19:239-242. Parekh S, Andrawes S, Giordano C, Sharma R. Acute perforated acalculous cholecystitis. Appl Radiol. 2018;47(2):20-23. Prepared by Dr. Parekh while a PGY-3 Radiology Resident; Dr. Andrawes while Attending Gastroenterologist; Dr. Giordano while Attending Interventional Radiologist; and Dr. Sharma while Attending Radiologist at Staten Island University Hospital, Staten Island, NY.